The full moon of June will dip through Earth’s shadow early Monday (June 4) in a partial lunar eclipse. Eclipses of the sun and moon always come in groups. A solar eclipse is always accompanied by a lunar eclipse two weeks before or after it, since over those two weeks the moon travels halfway around in its orbit and is likely to form another almost straight line with the earth and sun. 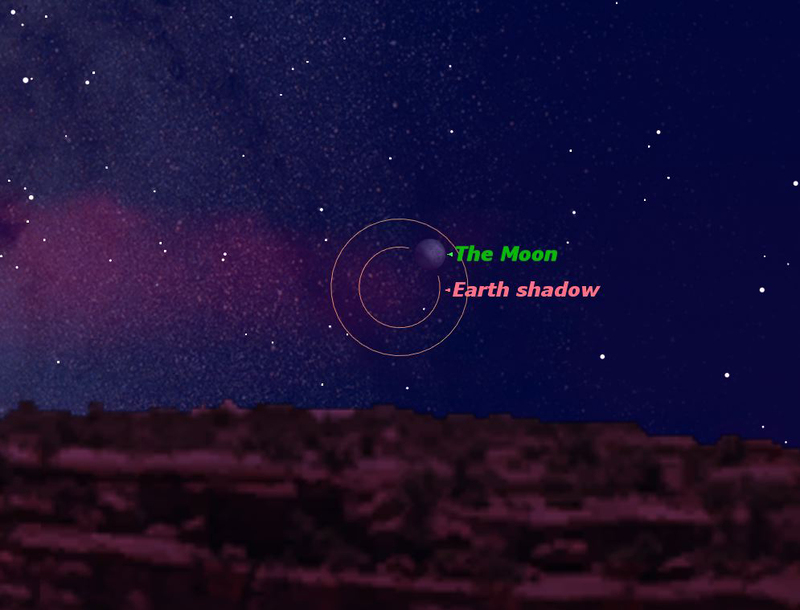 If the solar eclipse is a “central” one (either total or annular) the lunar eclipse is likely to be one where the moon will only partially interact with the shadow of the Earth. And the so it is that two weeks after casting its shadow over eastern Asia and western North America in the annular solar eclipse of May 20-21, next Monday’s full moon will swing around to skim through the northern edge of the earth’s own shadow. Those regions of our globe that enjoyed views of the solar eclipse will again be favored for a view of the upcoming lunar eclipse. Nearly two-fifths of the moon will slowly slip into the Earth’s umbral shadow. Although the moon will remain bright throughout the partial lunar eclipse of June 4, it will be set in a very interesting starry background (just inside the border of the non-zodiacal constellation of Ophiuchus, the serpent holder and about 6 degrees above and to the left of the bright ruddy star, Antares). Since the moon will track well to the north of the center of the shadow, it will be its lower portion that will be darkened. The eclipse begins at 4:48 a.m. EDT (0848 GMT) with first penumbral contact. The penumbra is the pale fringe of the Earth’s shadow, the outer part of the penumbra is so light that the moon doesn’t begin to change appearance until the lunar limb is about 70 percent across it. Around that time, about 50 minutes later, the lower left portion of the moon’s disk should begin to show signs of a slight smudge or shading as the moon progresses into the darker/inner portion of the penumbral shadow. A little over 20 minutes later, the partial eclipse commences with first umbral contact at 6 a.m. EDT (1000 GMT). Now the moon is entering the umbra (dark inner portion of the Earth’s shadow). Mid-eclipse comes at 7:04 a.m. EDT (1104 GMT), when the lower 37 percent of the moon will be tucked inside the umbra. To the unaided eye the umbra might appear dark and colorless, but binoculars or a telescope might show it glowing dimly orange, red or brown. The partial phase lasts a bit over two hours and ends at 8:06 a.m. EDT (1206 GMT). Finally, the moon will leave the penumbral shadow at 9:18 a.m. EDT (1318 GMT).